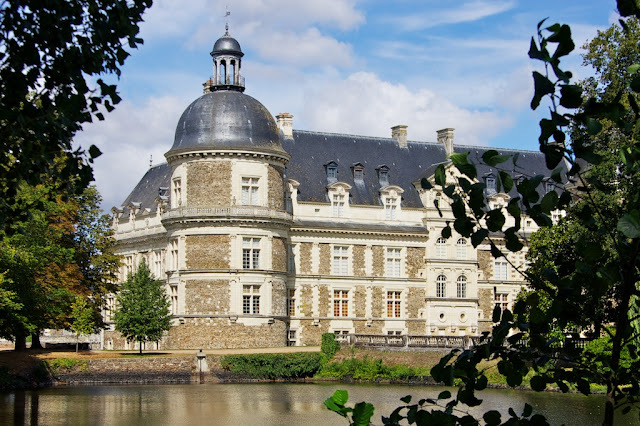 The first image from Serrant is the first view of the chateau as you leave the visitors payment desk. This is effectively the side entrance where you would go on the bridge over the moat and through the smaller set of gates and into the courtyard. The weather was lovely but at times a little too harsh for decent photos. 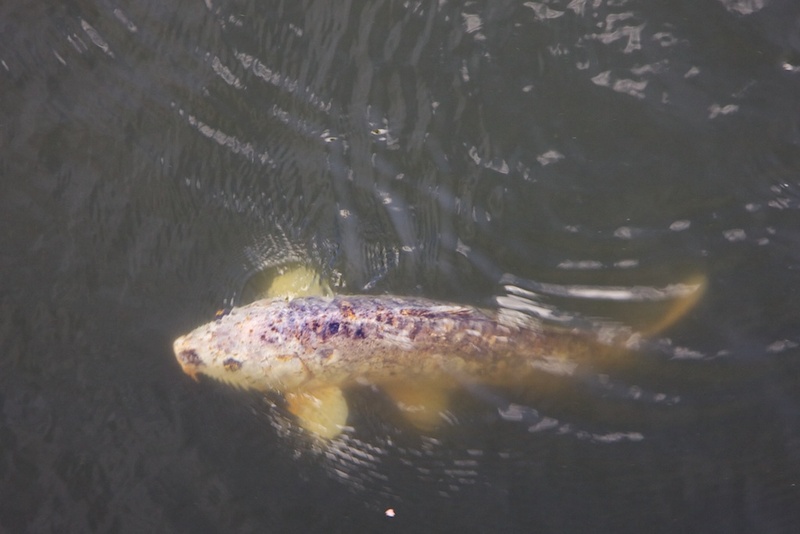 As we crossed the bridge over the moat at the side gate there were some big fish swimming about below us. This one was very excitable and looked as if was trying to get out of the water. 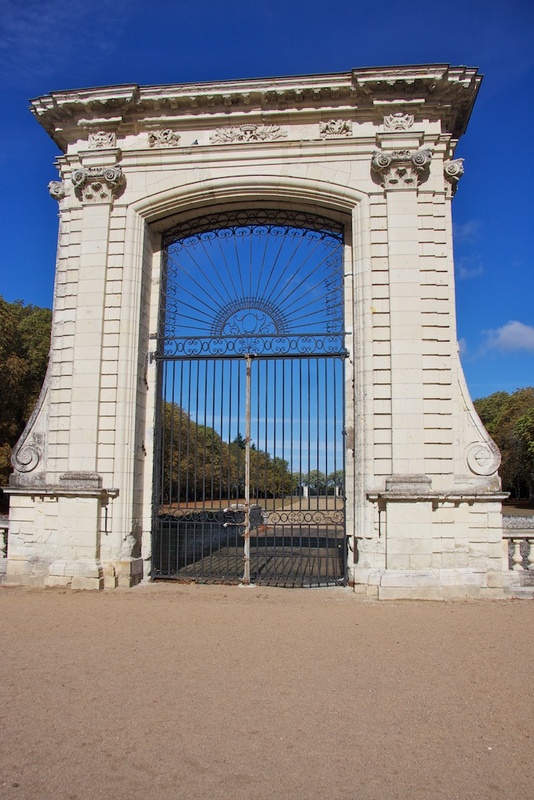 Once inside the courtyard we had this wonderful view of the main gate which had a straight drive down to some more gates onto the main road. At either side of the drive was a stretch of lawn and then a few avenues of trees all in straight lines. We waited in the courtyard to join the guided tour around the inside of the chateau. The tour started in some dark passages through the cellars where we were shown the original wiring from when the chateau first got electricity. It looked quite scary but it's all been replaced by modern circuits because it was dangerous. The tour then went around the kitchens which were also in the cellars where we saw some amazing old kitchen equipment. Then up the stairs through the dining room, library music room and then up more stairs into the bedrooms. There were some amazing things in there but I wasn't allowed to take photos so nothing to show here. I could have bought some postcards or a guide book and scanned them but it's not the same. 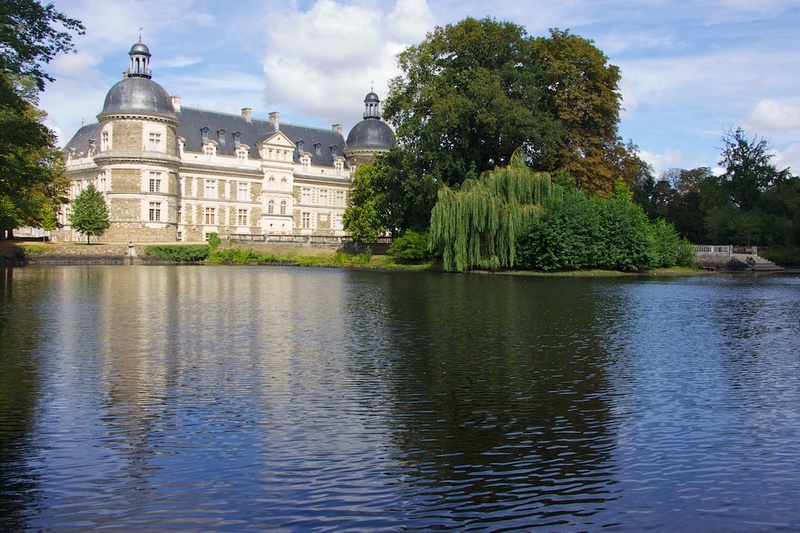 After the tour we went to walk around the lake where we had some wonderful views of the house reflected in the lake. I love the clump of trees beside the lake and you can just see at the other side of the trees are some steps down to the water. I guess they would probably have had boats on the lake at one time. It wasn't possible to walk around the lake as it was fenced off so we had to head back towards the house where I took this next shot using some of the trees around the lake to frame the shot. It's quite odd how, what effectively is, the back of the house was much fancier the the front. I suspect people living here used to spend more of their time at this side of the house by the lake. There were probably some lovely formal gardens down each side of this path but now there is just grass. Directly behind me when I took this shot are the steps down to the lake that I mentioned earlier. This shot shows the little bridge from the back doors which don't look as if they are used any more. There is a little door under the bridge which I think is where the kitchen is situated and someone had put bread on the step for the swans that were in the moat. 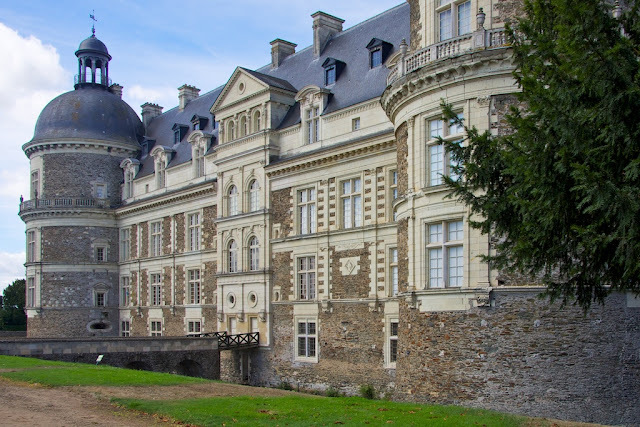 The family that own the chateau still live here up on the top two floors in the roof space and the two wings at the front of the chateau. We walked all the way around the house and this shot shows the bridge that we crossed to get into the courtyard and the bridge to the main gate. 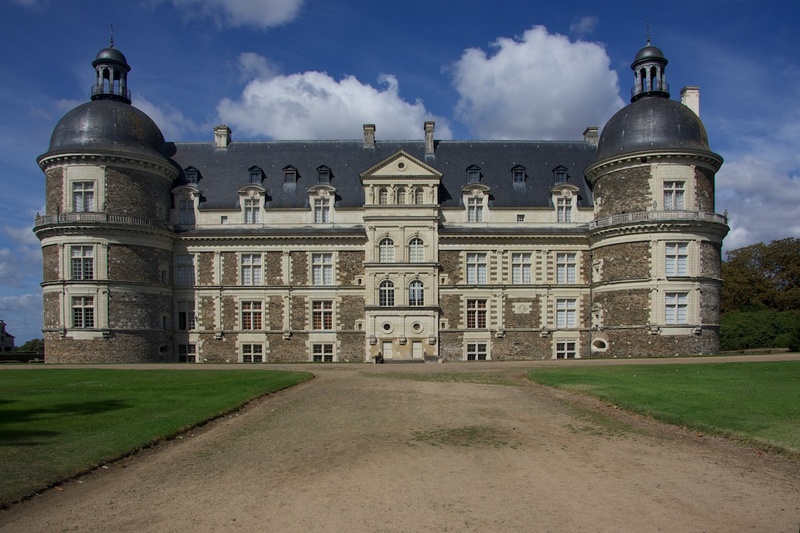 On the right of the picture is one of the private wings of the chateau where there is a little chapel for the household to use. In the centre of the image is one of the two separate buildings which flank the main gate. I'm not sure what these were used for but I suspect they could have been the servants quarters because the damp dark passage where we began the tour started in the cellar of this building. There were some other buildings where we entered the grounds from the car park but they seemed to be private residences now apart from the first one where we paid to come in. There was another lake next to the one where I took the photos but that looked more like a mill pond or a little reservoir. There was also a pigeonerre on site but it was currently being refurbished and was completely covered by a tarpaulin. 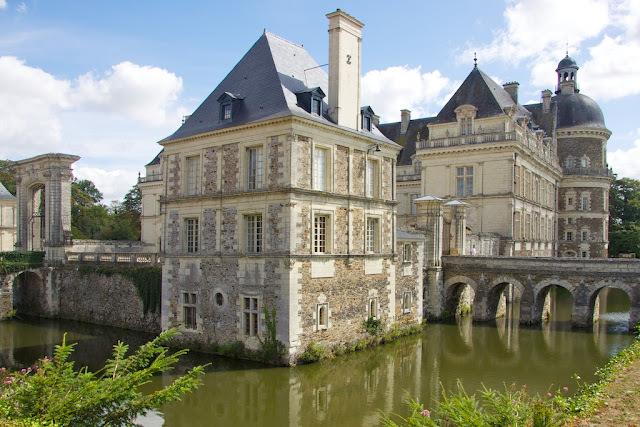 It's quite a nice chateau but certainly not one of the best in the Loire Valley. 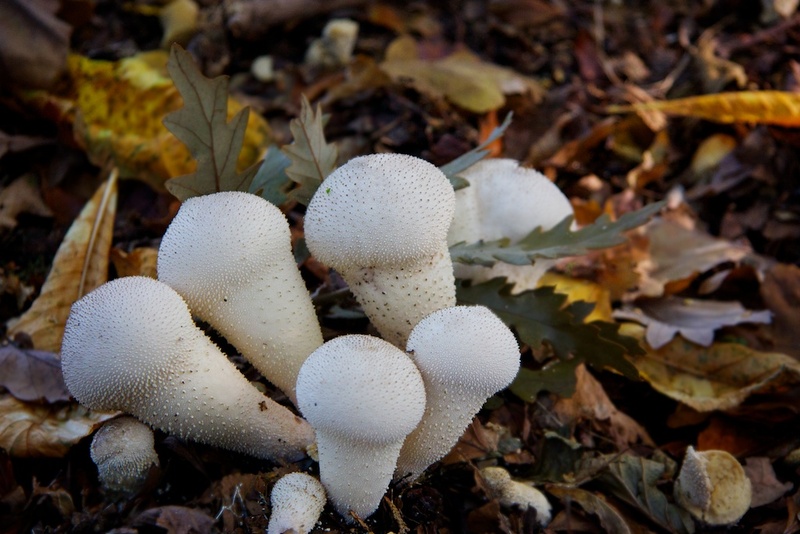 It's that fungi time of year and any walk through the woods or any other dark, damp places will find some kind of mushroom. As with my previous fungi post the challenge is to find enough light to get a decent shot or ramp the ISO on the camera as far as you can without getting a lot of noise. 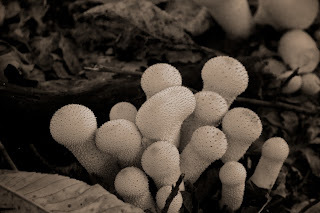 This first image was taken near Bretton in a pile of big old logs piled up at the side of the path. The logs have obviously been here a while with the part of the image on the right showing a lot of woodworm holes. 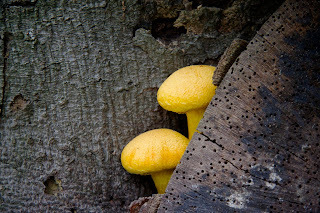 These two little yellow mushrooms were tucked in between the logs and are quite colourful. There were some other mushrooms of a different kind up on the top of a pile of logs but it was too dangerous to climb up and photograph them. 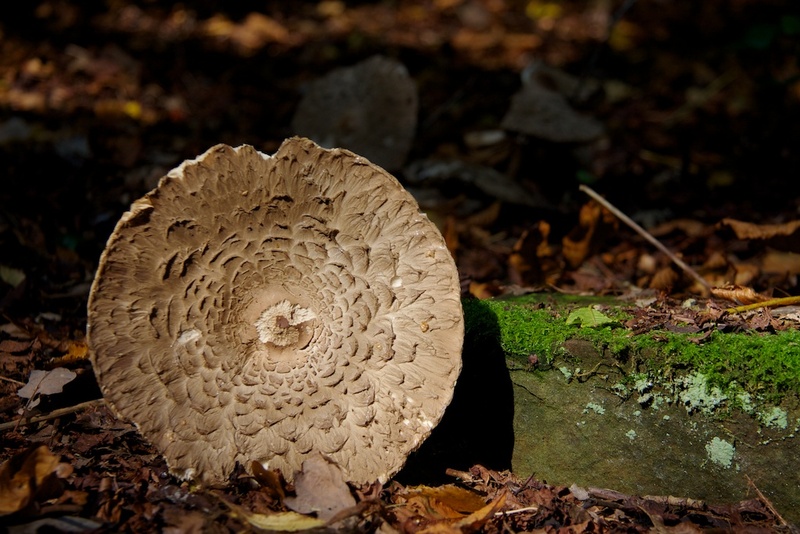 We also saw some other big mushrooms out in the field and although the light was a lot better the mushrooms were in a very sorry state. The rest of the shots in this post were taken in Beaumont Park near Huddersfield. This first one was on its own at the entrance to some caves. I had to remove a layer of old leaves from around it so I could get a clear shot. I decided to covert it to black and white (using the blue filter setting) because I felt it brought the contrast up nicely and there wasn't much colour to be seen anyway. 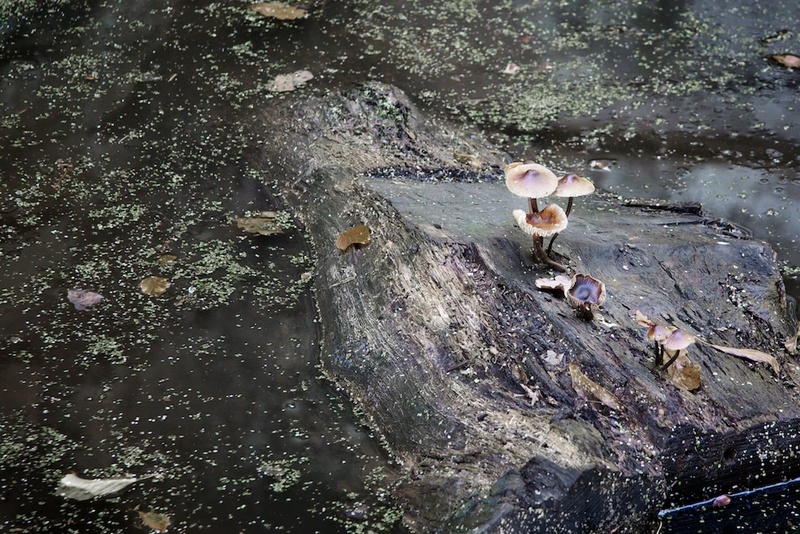 These next mushrooms were growing on an old log floating in a swampy looking pond. I couldn't get very close to them so this was the best shot I could take. The green dotty weed on the top of the water was very bright green and I thought it really detracted from the main subject of the mushrooms so I selectively desaturated the green and yellow so that the mushrooms came forward a bit. 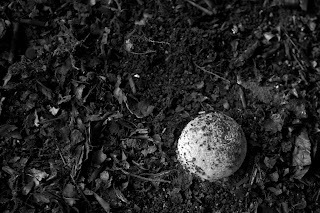 one fallen over in the darkness of the background. Just under one tree there were several patched of this strange spiky mushroom. Some of the patches were old and had started to decay but the others were quite fresh and bright. 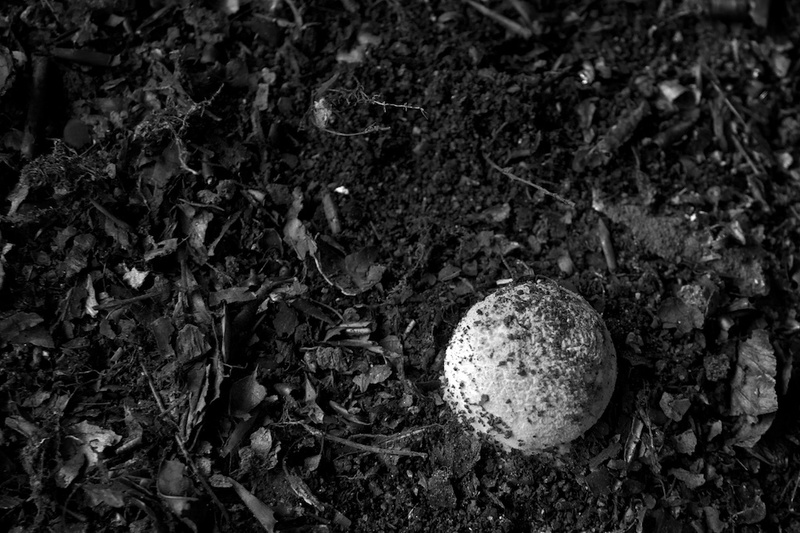 In the last photo I converted to monochrome with a hint of brown as a comparison to the previous photo. I'm not sure which version I prefer. I think the colour in the leaves are a bit of a distraction in the first version but maybe the second one is too plain. Now I'm looking at the second photo again I'm feeling the leaf on the left in the foreground is a big distraction so I might have a go at cloning it out or darkening it drastically towards the corner. I realise that I still haven't posted any of the other photos from my previous visit to Beaumont Park and I have lots of photos from France still to process. I think I might need to try and post more regularly to catch up a bit. The thing is I've been considering starting a new blog about getting started with digital photography, very much a beginners guide. I've only had a decent camera for about three years so I don't consider myself an expert but I might be able to help some people who are at the same stage that I was three years ago. I guess I need to think it out a bit more first but I'll post some links if I ever get it up and running. 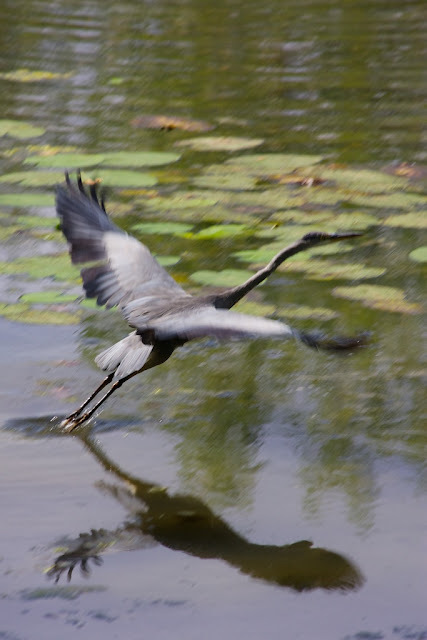 I've always had problems getting any decent photos of herons around home because they either fly away before I get anywhere near them or I see them when I don't have my camera with me. There was even one occasion when I had a heron in my sights and it flew off just before I pressed the button. When I looked up from my camera I realised the the dog had run after it while I was concentrating on sizing up my shot. 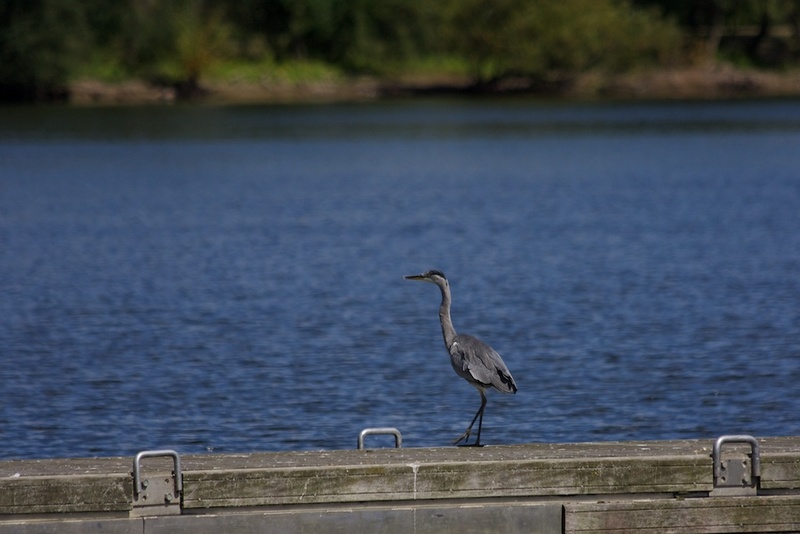 So when I spotted a heron on this floating jetty I was hoping I might have better luck. It was looking quite relaxed and there were a number of seagulls sharing the jetty. We were at the Lac de Maine near Angers in France on a lovely hot sunny day. It's a leisure lake just across the river from the city and had areas for boating and a sandy bay where the locals sunbathed and swam. 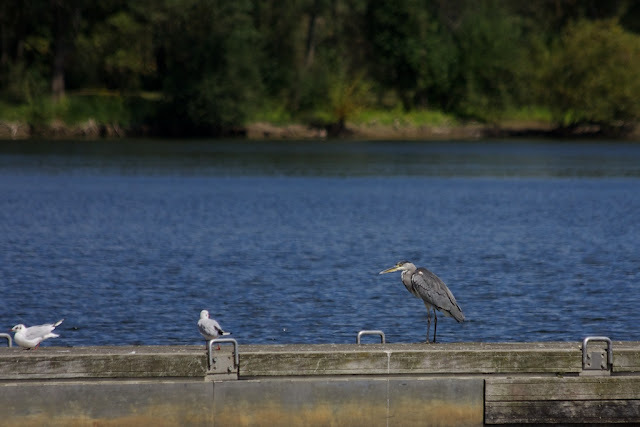 As I crept closer the seagulls moved away and the heron began to look restless. It stood up and started waking along the jetty. As I tried to get a little closer the seagulls took off closely followed by the heron. I was ready for it to take off and had adjusted my camera for a bigger depth of field making sure that the shutter speed was still quite fast. Because it was sunny I was still able to get 1/750th of a second at F8 keeping the ISO at 100 and setting the exposure compensation to -1 ev. I was also panning as I took the shot which is why all of the background was blurred even at F8. 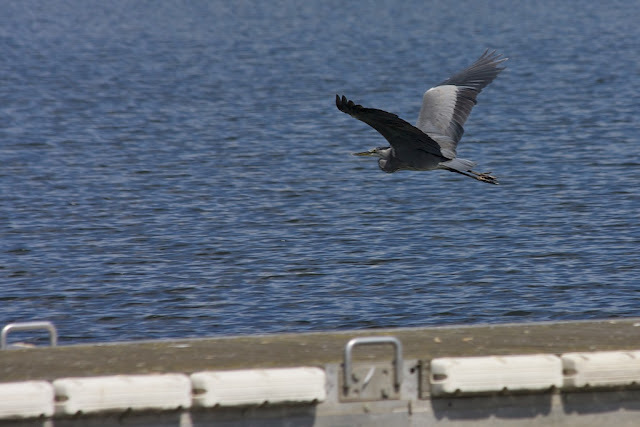 The heron kept quite low and went across the sky rather than way from me as it flew so I kept re-focussing and shooting. 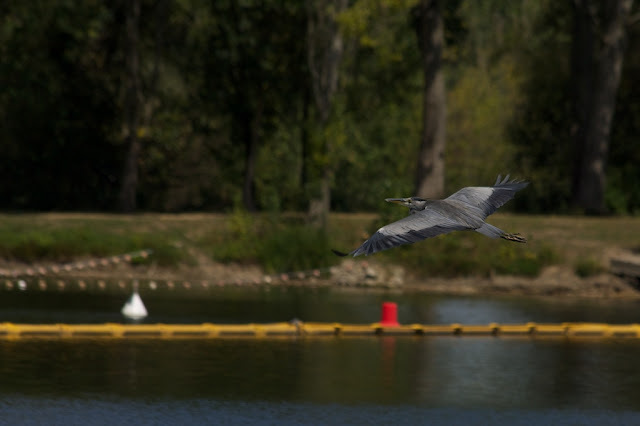 In the next shot it was heading towards the beach area of the lake and then over some trees at the edge. After it had gone we carried on walking around the lake area and noticed a couple of pods next to the lake where people were fishing. 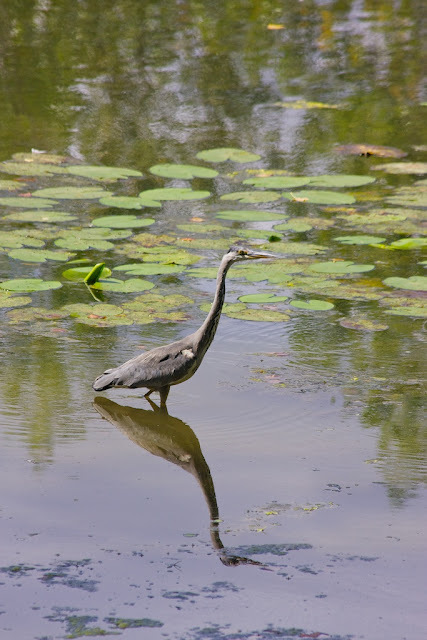 As we came closer to the pond I spotted the heron wading in the shallow water next to some water lilly pads. I am fairly sure it was the same heron that I'd seen on the lake as this pond was in the general direction it was heading when it flew off before. I again tried to get closer without it seeing me and the trees around the pond gave me a bit of cover. Just after I took the previous shot it must have seen me and flew off again. When I first looked at the display on the back of my camera I thought I'd got a great shot of it taking off but when I got a closer look I realised the it was mostly blurred. I guess the reason was that it was a bit darker around the pond than by the lake so the shutter speed had dropped to 1/250th of a second and the heron was moving its head, neck and wings too fast. The legs, tail feathers and the back are almost not blurred but I really needed the head to be a lot sharper and I could have got away with the wings been blurred I suppose. I should have aimed to get 1/750th or even 1/1000th of a second on the shutter speed to have got a better shot. I should really have bumped the ISO up to 400 or 800 to achieve the faster shutter speed, so it's a lesson I need to think about more when trying to photograph wildlife (or anything else) which is likely to move fast.